Ready to make your blogging dreams a reality? I want to help! Conquer the blog setup process with ease with my newest course, Blog Start-Up 101! with my easy-to-understand, easy-to-implement tutorials and lessons! using the "trial and error" method. and learn how to set up your blog for success from the beginning! Save yourself HOURS of time with blog setup and get to the part you’re really passionate about—sharing your voice with the world! Enroll now for ONLY $37! Hi! I’m Crystal Paine, wife to Jesse, mom of three kids (Kathrynne, Kaitlynn, and Silas), New York Times bestselling author, speaker, business consultant, and founder of MoneySavingMom.com and YourBloggingMentor.com. When I first started blogging over 12 years ago, there weren't any blogging experts, blogging courses, or blogging how-to manuals. In fact, most people didn't even know what a blog was! Since I didn’t have anyone to hold my hand and teach me the ins and outs of how to set up my blog, I had to learn it all on my own. And trust me, it wasn't easy. I well remember many nights when I felt like pulling my hair out because I couldn't figure out how to get something to work or the many days when my blog would be down (yet again!) and I couldn't figure out how to fix it! Now, over 12 years later, I successfully run two blogs (MoneySavingMom.com and YourBloggingMentor.com) and believe beyond any shadow of a doubt that if I can be a successful blogger, so can you! And I want to help you so you spend less time feeling frustrated and overwhelmed by the technical aspects of blogging and can spend more time enjoying inspiring others through your posts! What is Blog Start-Up 101? Blog Start-Up 101 is a beginner level blogging course created to help new bloggers break into the blogosphere by helping you learn how to set up your blog for success—the easy way! I created this course to cater to the very specific (and often overlooked) needs of aspiring bloggers who need a helping hand to get their blogs set up and ready to publish. How to setup your web hosting and domain name. What WordPress is and how to install and navigate it on your website. How to create, edit, and publish your first blog post. Why you need an email newsletter, how to get yours set up, and my top tips for a successful newsletter. What social media you should be using, how to get your blog connected to the different social media platforms, and some of my best practices for social media. 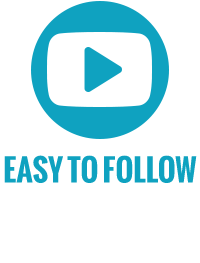 Plus, a number of bonus videos covering additional how-to’s to help boost your blogging know-how! BUT this course isn’t for everyone. You don’t currently own a blog and you’d really like to start one up, but have no idea where to start or how to do it. You’d love to have help going step by step through the process of setting up your blog so you don’t have to figure it all out on your own. You get overwhelmed with too much tech-y lingo and just need a straight-forward, easy-to-understand guide to help you get your blog set up. What Can I Expect When I Enroll? 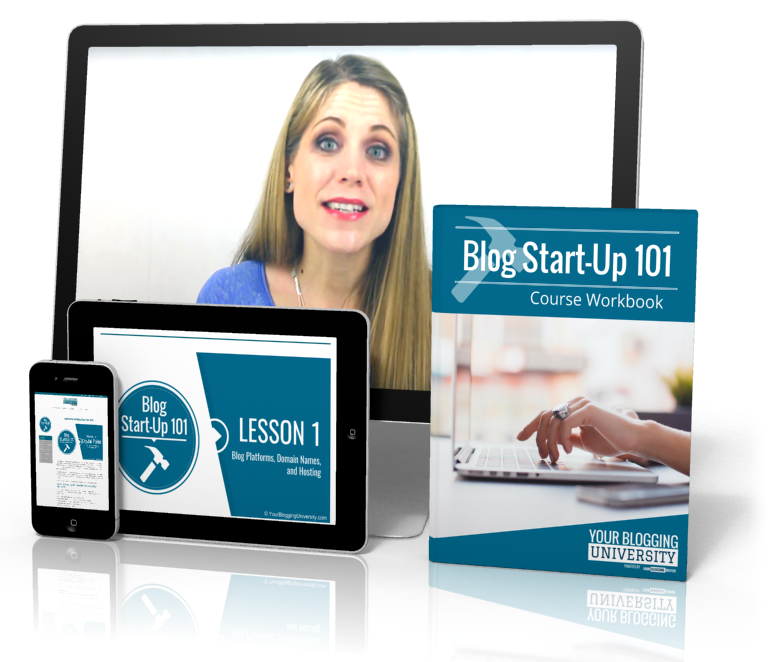 Blog Start-Up 101 is our very first full-length Beginner Blogging course published on our new customizable blogging education platform, Your Blogging University™. A FREE student account on our new (and growing!) Your Blogging University™platform. 5 self-paced, easy-to-understand lessons covering the most important blog setup topics for beginners. Detailed video tutorials with each lesson showing you visual how-to’s to make the blog setup process super simple with instructions that are easy to implement. Printable PDF workbook including the entire course lessons to make studying easier on the go! BONUS video tutorials, recommended resources, and more! Not sure if Blog Start-Up 101 is right for you? Download the course syllabus here to see what’s included in each lesson! Not techy? Not a problem! No technical experience necessary! 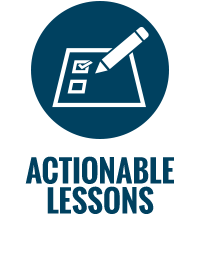 Each day’s lesson comes with actionable steps to help you get your blog ready! 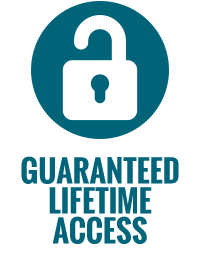 Unlock unlimited lifetime access when you enroll today! 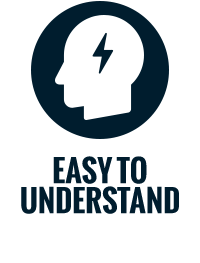 Enjoy step-by-step help with our comprehensive video lessons! 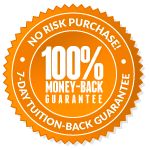 "I purchased your course and had my child development blog up and running within a week! I thought it was really straightforward with great tips. I loved that it was not overly "wordy" as I’ve seen on other how-to blog guides. The key advice for me was thinking of blogging as a marathon and not a sprint. I’m very excited for what the future holds!" "I need to thank you, Crystal, for being a huge help in getting my new blog started. My goal was to have it up and running by June 14, but after completing your first Blogging University class, I published my first post on June 2!" At the end of May, I had 2,700 pageviews and using some of the strategies from YourBloggingMentor, I was able to jump to more than 27,000 pageviews for June!!"